Jell-O Play edible mud chocolate. Slime. That gooey, sticky, icky stuff that kids like and parents don’t. Slime has proved to be one of THE most favorite things that kids enjoy playing with. Imagine if they could eat it too? Yup, it’s true. The creativity of culinary masterminds at Jell-O have created slime that is edible! 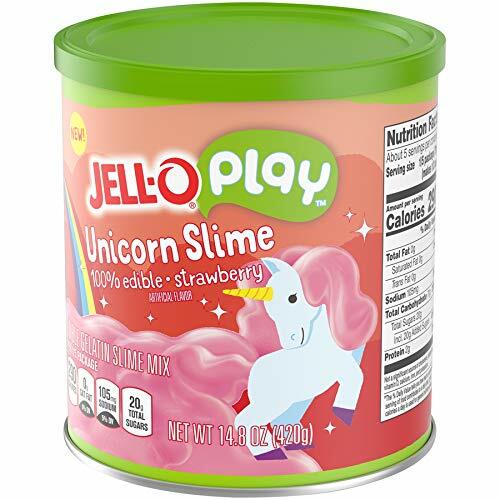 This slime is made of gelatin and currently comes in two amazing flavors – Unicorn Slime (which is strawberry flavored) and Monster Slime (which is lime flavored). This is not the first time that edible slime has been made, but it is way better than the previous versions because the previous ones were homemade and needed a lot of preparation, not to mention the intense clean-up required after the mess is made. Thanks to Jell-O, the new edible slime comes in jars and is very easy to make and according to the company, the slime comes off clothes and skin easily when washed with water and soap. Now you don’t need to worry about getting off that sticky slime off your children and your house. Wanna try the new edible Jell-O Play Slime? It comes out only in December but you can pre order yours on Amazon now. One jar of the Jell-O Play Slime costs $9.99 on Amazon and is enough for two sessions of playing followed by eating. For those children (and even adults) who love playing with their food, Jell-O has some more exciting stuff for you. Along with this new slime, the new Jell-O Play line collection brings kits that help kids build their edible toys, including Jell-O Mud, Jell-O edible stickers, Jell-O Jigglers and Jell-O Play build-and-eat kits.